Our smart speakers continue to get smarter over time, and one of the features recently added to the kit made by Amazon and Google is support for multi-room audio — in other words, the option to play the same tunes in multiple rooms at once. Here's how to set it up with a group of Amazon Echos, Google Homes, or Sonos smart speakers. There are various tweaks and caveats to bear in mind depending on the type of system you're using, which we've mentioned below. Overall though, the setup procedure isn't difficult to manage, and you can easily edit your speaker configuration whenever you need to (should you shift one speaker to a different room, for example). Once you've got your Echo plugged in and showing an orange light on the top, you need to fire up the Alexa app for Android or iOS and choose Settings then Set up a new device from the main app menu. Follow the instructions on screen to get the Echo connected, then repeat the process for all the smart speakers you've got (note that third-party Alexa-enabled speakers aren't supported). To get your choice of music platforms added, go to Settings then Music & Media - just tap on any of the services you see, such as Spotify, to enter your login credentials and get the service working with your Echo devices. Tap Choose default music services to pick which one is started up automatically in response to a voice command. Next, choose Settings again and pick Multi-Room Music under the Audio Groups heading. Either pick from one of the presets (like "Dining Room") or enter a custom name and tap Next — the following screen lets you pick from all the Echos you've set up. Tap Save and you're just about ready to go. 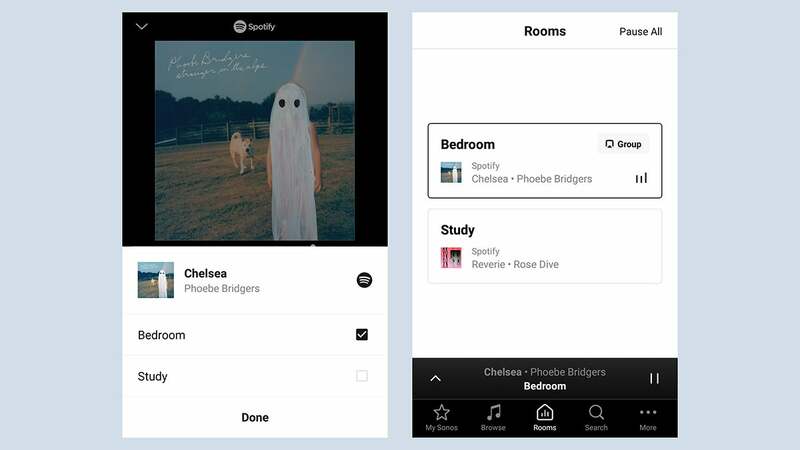 Now you can tell Alexa to play music just as you normally would, except you add in the name of the new group of devices you've just configured: So "Alexa, play Phoebe Bridgers downstairs" would work, for example (just drop in whichever artist you want to listen to). 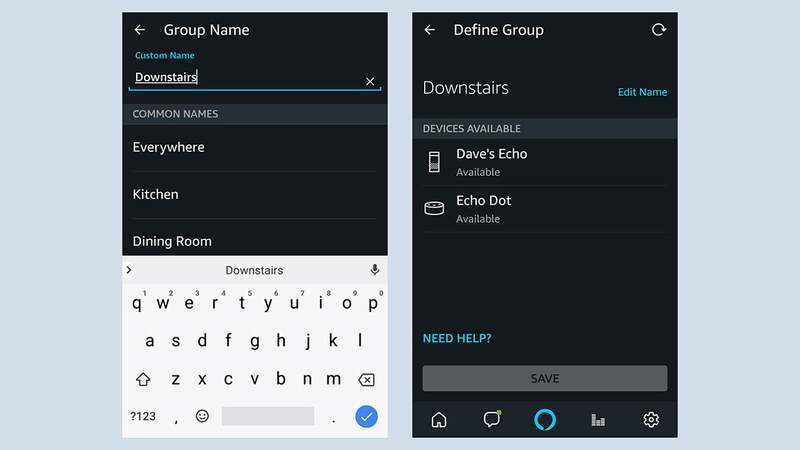 Your new group appears under the Smart Home entry in the Alexa app menu and can be edited from there. Use the normal commands - like "Alexa, stop" - or the Alexa app to control playback, and your actions will take effect across all the speakers in the group. Note that if you want to play different music on different speakers or groups of speakers at the same time, you need an Amazon Music Unlimited Family Plan. Setting up a Google Home speaker couldn't be much more straightforward: You plug it in, wait for the welcome message to sound, then load up the Google Home app for Android or iOS. Inside the app, you should see a "device found" message at the top, so just tap Set up and follow the instructions. Repeat the process for your other Google Home speakers. You'll get prompted to add various music services during the setup process, but you can edit them at any time by choosing Music from the main menu in the Google Home app — just tap on the music service provider name to add it, and check the box next to the one you want to use by default (the one that gets used unless you specify another). That's enough to play music on one Google Home. To link them together, open the Google Home app and tap the Devices button in the top right-hand corner. Tap the menu button (the three dots) on one of the devices you want to group together, then choose Create group — give the group a name, pick the speakers and devices to include in it, then tap the Save button. 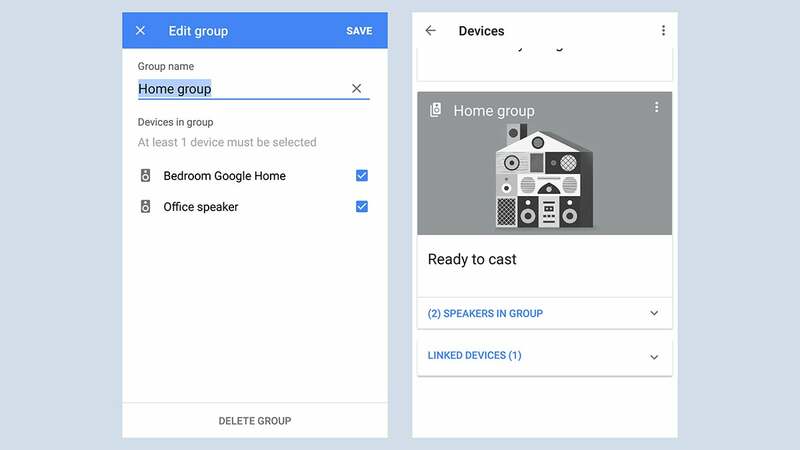 After a few seconds, this new group appears as a separate card inside the Google Home app - you can then control the group with voice commands or cast the audio from an app to it just as you can to an individual speaker. Note that Chromecast audio devices can be added to a group as well as Google Home speakers. With that done, just talk to the group as you would a normal Google Home speaker: Say "hey Google, play rock on upstairs", or "hey Google, play next song on upstairs", or "hey Google, set volume to 40 per cent on upstairs", for example. Sonos has of course been in the multi-room streaming game longer than Amazon or Google have, and everything is very easy to set up — though you want have any voice control. 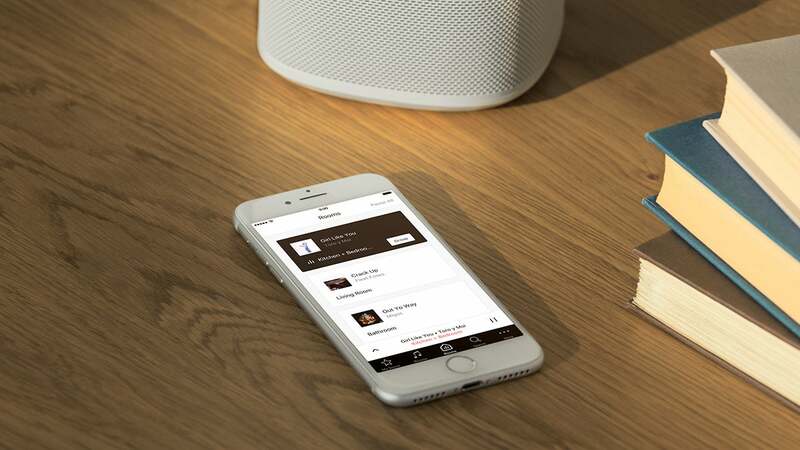 With your Sonos speaker plugged in, download the Sonos app for Android or iOS, then choose Set up a new Sonos system when you've launched the app. Follow the instructions on screen to configure the speaker for use, and repeat for any other Sonos speakers you've got. Sonos is geared for multi-room audio right from the bat, so you can just hit the speakers button at the bottom of the playback window, then select multiple speakers to hear your tunes on all of them at once, no further configuration required. Or, just select the speakers downstairs, or the speakers upstairs... it just takes a few taps. If you have more than one Sonos speaker in the same room, then you can group them: Inside the Sonos app, tap the Rooms tab, then tap Group next to one speaker — pick the other speakers in the same room, then Done to confirm. You can have multiple groups and jump between them. The Sonos software includes some neat tricks that show it still has an edge over Google and Amazon. You can, for example, stop playback in one room and pick it up from the same point in another — just tap the speakers button on the playback window, tick the room you're going into and untick the room you're leaving, and off you go. It's also possible to link two speakers together in stereo configuration, if needed. Tap More then Settings and Room Settings: Pick your first speaker, then choose Create Stereo Pair, and select the second speaker. You'll need to press the volume buttons as prompted to show which speaker is on the left, then you're good to go. Be away because of transfer and computing speeds there can be some delay leading to the sound appearing to echo as the music isn't in sync between devices.